The mobile versions of the Dropbox client have supported screenshot sharing for some time now. When the feature is enabled, it saves a copy of a screenshot that you take with your photo automatically to the camera uploads folder of your Dropbox. I use this to get screenshots that I take on my Android device on my Windows PC, so that I can edit them and publish them in reviews. If you have been running an experimental version of Dropbox on the desktop, you may have noticed a screenshots feature under Import recently as well. Yesterday's release of Dropbox 2.4 Stable introduces screenshot sharing to all users of Dropbox who run the software on Windows or Mac machines. Tip: If the feature does not work on your system when you hit the print key on your keyboard, open the settings of Dropbox and check under Import there to see if "share screenshots using Dropbox" is enabled. The prompt pops up when you hit the print key the first time after the update to version 2.4 of the client. Here you have the option to disable the feature if you do not want your screenshots to be saved to Dropbox automatically, or enable it. All screenshots will be saved to the Screenshots folder of the Dropbox directory on the computer system and automatically synced with the account so that they are accessible on the Internet and on other connected machines. The client supports two screenshot taking and sharing options right now. You can tap on the print key to save a screenshot without further interaction to the screenshots folder, or use Shift-Print instead to save it to the clipboard of the system instead. Side note: if you are using another screenshot tool, you may run into issues when it and Dropbox are running. Depending on which you start first, you may not be able to use the print key in the other. There is unfortunately no option right now to change the hotkey in Dropbox. The main issue that I have with it is that it only supports full screen screenshots. You cannot take a screenshot of a window or a custom rectangle using the application which limits its use. Move to Dropbox is a new context menu entry to move files or folders that are located outside of the Dropbox sync folder to Dropbox. 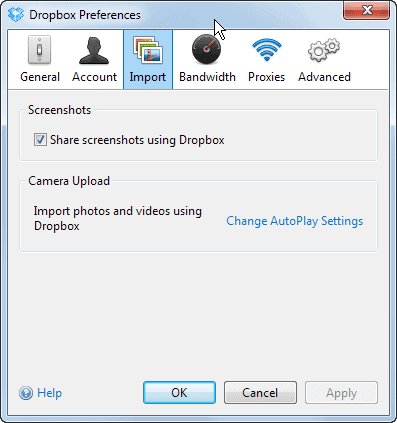 You can disable the screenshot import feature of Dropbox at any time in the preferences. You can download the latest version of Dropbox from the forum right now. 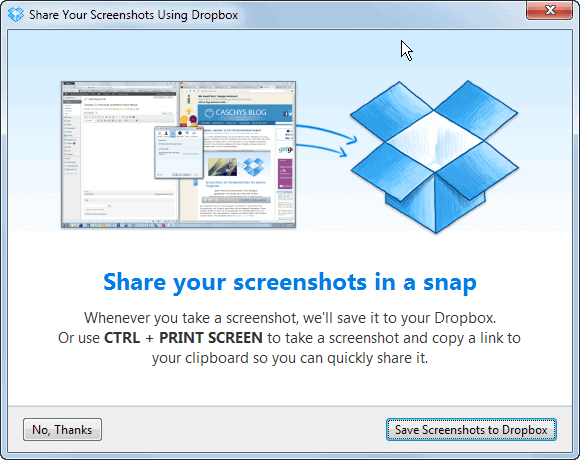 I won't use the screenshot functionality of Dropbox on my desktop system as it is too limiting in comparison to other screenshot taking tools such as SnagIt. The transfer speed improvements for large files on the other hand will certainly come in handy. It is available from the forum link posted in the review. This is weird to me, why they publish new versions on forum instead on main site ? I do not know. They will probably roll it out at a later time. One of the least useful and rather annoying features of Dropbox. Switching it off does not work. So I guess we have to live with this bug.